Can you confirm these amateur observations of Calumma brevicorne? 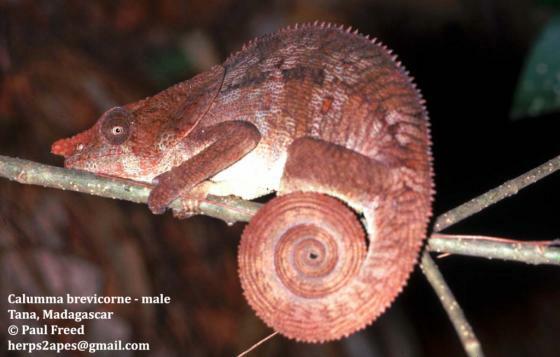 Distribution E/N Madagascar, elevation ~900 m.
Diagnosis Diagnosis.— A Calumma chameleon from Mada- gascar that differs from all congeners by the combination of a male single ossified rostral appendage projecting at least 2.5 mm (anterior to the mouth), which is laterally flattened, with three longitudinal scale rows at base in lateral view; adult SVL 90–170 mm; and a pair of large occipital lobes that are dorsally united to each other by up to 3 mm in adult. Calumma brevicorne is most similar to C. amber and C. crypticum, but can be distinguished by its male rostral append- age (laterally flattened, with three longitudinal scale rows at base in lateral view vs. dorso- ventrally flattened, with two longitudinal scale rows), l arge adul t SVL (110–170 mm vs . ,117 mm), and occipital lobe size (al ways reaches a level at or below ventral margin of eye vs. may only reach a level above ventral margin of the eye). [from RAXWORTHY & NUSSBAUM 2006]. Comment Chamaeleo brevicornis hilleniusi BRYGOO, BLANC & DOMERGUE, 1973 has been elevated to full species status. individual. C.J. Raxworthy examined the holotype (MNHN A-172), and RAXWORTHY & NUSSBAUM (2006) conclude that this is a typical adult male Calumma brevicorne with mutilated occipital lobes. The large size of this male (130 mm SVL) and form of the rostral appendage (with 5-mm projection) all fit diagnostic features typical of C. brevicorne. Etymology Named after Latin brevis = short and cornu = horn. Brygoo, E. R. & C. A. Domergue 1970. Notes sur les Chamaeleo de Madagascar. C. brevicornis Günther, 1(7), C. tsarafidyi nov.subsp. Les hemipénis des Caméléons du groupe brevicornis. . Bull. Mus. nat. Hist. nat., Paris 42 (2): 311-320. Brygoo, E. R. & C. P. Blanc & C. A. Domergue 1973. 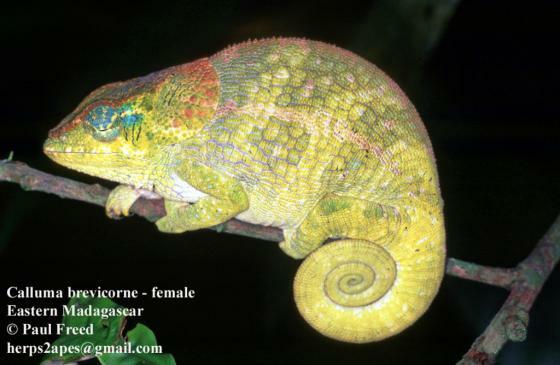 Notes sur les Chamaeleo de Madagascar. XI. Un nouveau Caméléon de l'Ankaratra: C. brevicornis hilleniusi n.subsp. . Bull. Soc. Zool. France 98 (1): 113-120.